SYDNEY, Australia (CNN) -- Steve Irwin, the Australian TV presenter known as the "Crocodile Hunter," has died after being stung in a marine accident off Australia's north coast. Australian media reports say Irwin was diving in waters off Port Douglas, north of Cairns, when the incident happened on Monday morning. Ambulance officers confirmed they attended a reef fatality Monday morning off Port Douglas, according to Australian media. pic: Irwin, pictured with wife Terri and daughter Bindi. Last edited by sarv_shaktimaan; June 25th, 2007 at 12:20 PM. Sad end to a flambouyant & cherished animal lover on screen. Its really sad but one question comes into my mind, whether animal rebel when some one encroaches their territory? Look what happened to Timothy Treadwell the Grizzly man. sad news.May his soul rest in peace. Yaar woh jo dekhne mai vimaaan jaisi machali hai naa woh. Last edited by Surendra; September 4th, 2006 at 01:09 PM. he was not. Typical aussie bloke from outback is more like accurate description of his personality. He was good man ... true blue aussie icon. RIP .. sad news... RIP. One question - When you have it all, why do you end up doing non-sense? For example, Christopher Reeves. He had it all, but he had to go horse riding or horse jumping. What happened? Broke his spine and finally died! Suddenly some folks think they can do a lot for which they are really not trained. Same case with JFK Junior. Had to fly a plane in bad weather as if he was a veteran Jumbo Jet pilot. End result? Dead! It was a freak accident. The last recorded person in Oz who was killed by a stingray was back in 1945! That's over 60 years ago. This was his passion ... only thing he knew ... loved and enjoyed it ... personally entertained visitors to his wild life park. 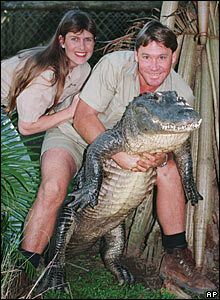 His father carried him in his arms ... just as he carried his young daughter Bindi in to the crocodile den. What you saw on screen is what he was like in person ... no acting and no make believe. Get an image link from a suitable site & use the [IMG] tag around it.